I Unfollowed Everyone On Facebook and You Won’t Believe What Happened Next – Sanspoint. I have never had a love/hate relationship with Facebook—more of a tolerate/hate relationship. It’s the most demanding of all the social networks I use, demanding, begging your attention to everything your friends and acquaintances are doing for the dopamine burst reward of comments and likes. All to get more information on you, to sell to advertisers and feed The Algorithm that determines what you see. Others have tried to break The Algorithm, some by liking everything they see, others by hiding everything they saw. These are fun experiments, but neither solves the problems I have with Facebook… the endless flow of information that demands my attention. There is only one solution. A couple of weeks ago, I unfollowed everyone on Facebook. My friends, my family, the groups I belong to… they’ve been explicitly denied the right to appear in my timeline. The result is beautiful, empty silence. When paired with Social Fixer to hide the rest of the obnoxious Facebook experience, (including my own sporadic posts), Facebook becomes just what you see above: a non-entity, pure empty state. I want to begin following the people closest to me—otherwise, Facebook becomes a huge web back-end for a messaging and event tracking service, rather than a social network. I’ve demurred, because I worry that even allowing a few, important souls into my quiet space will soon become overwhelming, not because of the people, but because of The Algorithm. The Algorithm is optimized to keep us using Facebook. It doesn’t just show us our friends statuses any more. The Algorithm shows us the comments our friends are making on their friends statuses. The Algorithm likes they’re making on posts by brands paying for reach. The Algorithm feeds us controversy, outrage, and all the noise, noise, noise, noise of people feeding The Algorithm. If there was some way I could be sure I’m only getting the important stuff from my friends: not the events they’re going to, the likes for whatever stupid meme George Takei’s social media person is reposting… if I could be sure I was only going to get signal instead of noise, I might be tempted to follow someone again. 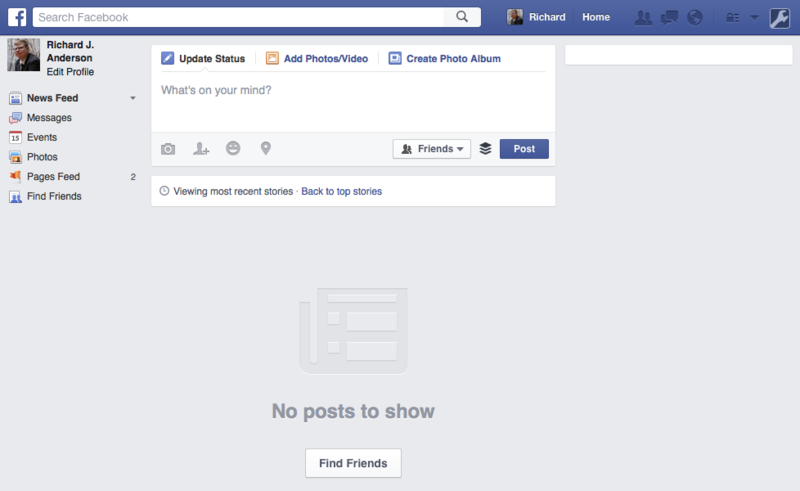 But, as it stands, I’ve somehow turned Facebook into a calm sea of emptiness. When every site on the web, every app on our phones, and so much else in our life makes constant screaming demands for our attention, I’ve managed to turn the most obnoxious of them all into a place of tranquility. Facebook is now a place that demands nothing of me. And, in return, I can give it nothing, guilt-free. At least until The Algorithm finds a way around it.